Eurosaadik Yana Toom (vasakul) ning tema kolleegid kohtusid Damaskuses Süüria ülemmufti Ahmad Hassouniga (keskel). Yana Toom ütleb, et kohtumised Süüria pealinnas lepiti kokku käigu pealt ja ta ei teadnud, kelle juurde järgmiseks viiakse. Delegatsiooni koosseisu kuulusid veel Lätist valitud Tatjana Ždanoka Roheliste ja Euroopa Vabaliidu fraktsioonist (paremalt) ja hispaanlane Javier Couso Permuy Euroopa Ühinenud Vasakpoolsete fraktsioonist. 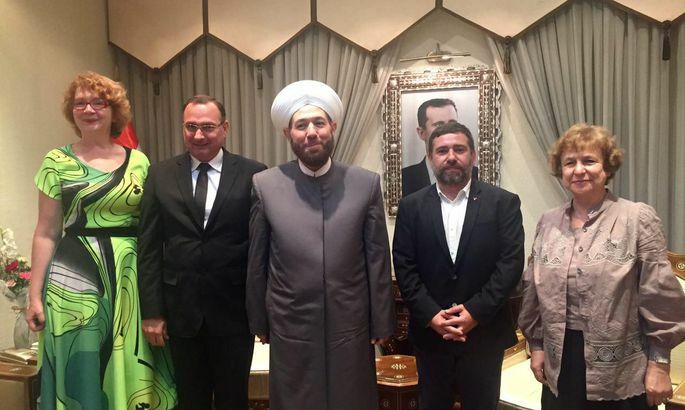 In Damascus, Member of European Parliament Yana Toom with colleagues met with the Syrian Grand Mufti Ahmad Badreddin Hassoun who has threatened to blow up Europe. Via her bureau, Ms Toom explained she was unaware, during her visit, of the curious address by the religious leader. The MEP explained the statement by Mufti away by the latter’s son having been killed four days prior by ambushed rebels. The MEP from Estonia advised all to remember that a representative of a nation in war, especially one who just lost his child, cannot be expected to come forth with politically correct statements. «I do not approve of his address yet I do call for certain reservations towards it, considering the emotion of the moment,» she added. Stirred by the death of his son, the Mufti afterwards issued an official statement. In his speech, he threatened to activate suicide bombers in Europe and the USA should foreign forces attack Syria. «The moment the first missile hits Syria, all the sons and daughters of Lebanon and Syria will set out to become martyrdom-seekers in Europe and on Palestinian soil. I say to all of Europe and to the US: We will prepare martyrdom-seekers who are already among you, if you bomb Syria or Lebanon. Do not think that the people who will commit martyrdom in France, Britain, or the US, will be Arabs and Muslims. They will be a new Jules Jammal or a new Muhammad Al-Durrah. They will all be like the righteous [of the past],» said the Syrian Grand Mufti. Born in Aleppo in 1949, Mr Hassoun rose to be Grand Mufti of Syria in 2005.